This was a day that started badly but ended quite well.. 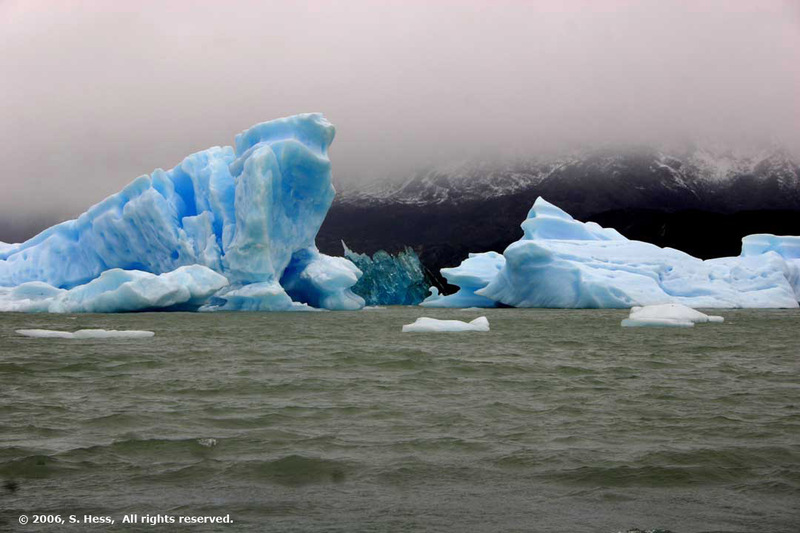 The weather this morning was cloudy, windy with occasional showers and temperatures in the upper 30s to low 40s... a typical day in Southern Patagonia this time of year. 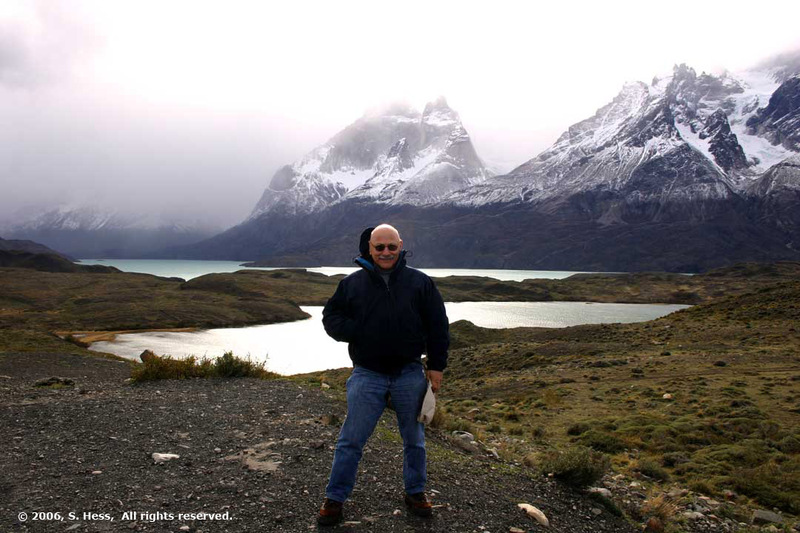 Our tour program and vouchers indicated that we were to be picked up a 7:30 a.m. for a tour of the Cave of the Milodon and Torres del Paine National Park. Susie and I were in the Lobby around 7:15 and I went out to take some pictures of the waterfront. 7:30 came and went and nobody arrived for us. At 7:45, I was getting a little concerned because the program was changed several times and it was possible that things got confused. A small bus, operated by the tour company stopped in front of the hotel stopped to pick up passenger so I felt a little better until I found out that it was heading for El Calafate in Argentina. At 8:00 I asked the front desk to call the tour wholesaler to find out what is going on... no answer. The next call was to the tour operator who told the us that we were on the list for tomorrow, but that he would send someone to pick us up. A taxi came to pick us up and we met the tour as they were leaving the Cave of the Milodon. This is where the day started to get better. The tour consisted of three women, one from Buenos Aires and two from Santiago, a driver and a guide and now us. The guide, Jose, and the driver, Alejandro, both spoke English (Jose better than Alejandro) and could not have been more pleasant. None of the passengers spoke English and with our limited Spanish and Jose's assistance we were soon communicating with each other. 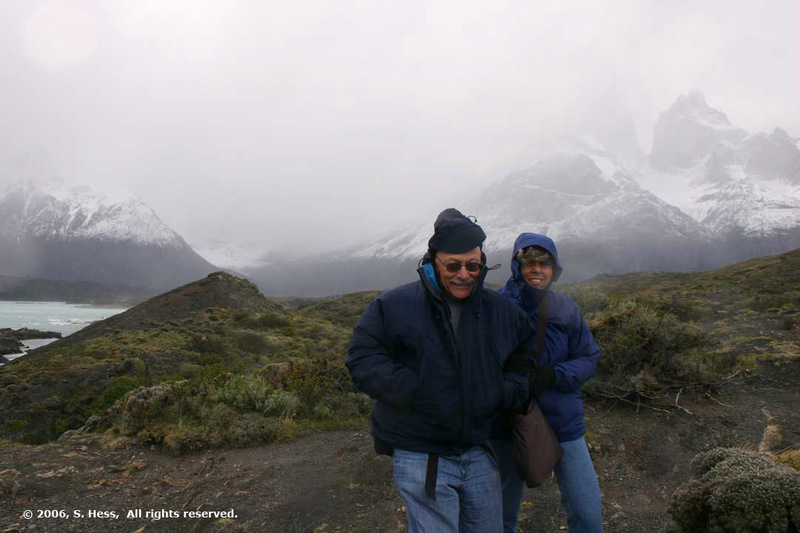 From the Cave of the Milodon the tour goes north to the Torres del Paine National Park. 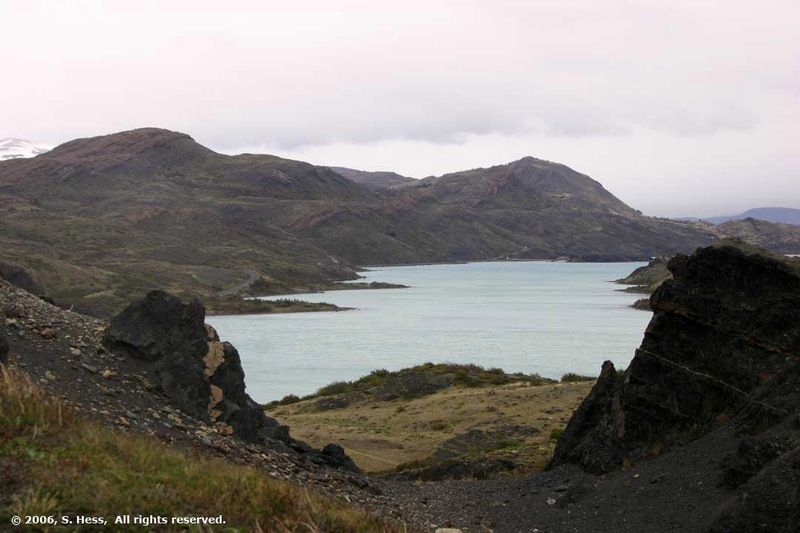 The road north from Puerto Natales to the park is paved until the turnoff to The Cave of the Milodon After that it is a fairly well maintained packed gravel road. The road skirts the Argentine border and one of the first things you note is the warning that there are mine fields on both sides of the road. Jose, said that the minefield was from a past "diplomatic disagreement" between the two countries or as we know it, a war. They have been working on clearing the mine fields, but is a slow process. I don't imagine it is a good tourist attraction. I haven't seen any posters that say, "come see our mine fields." 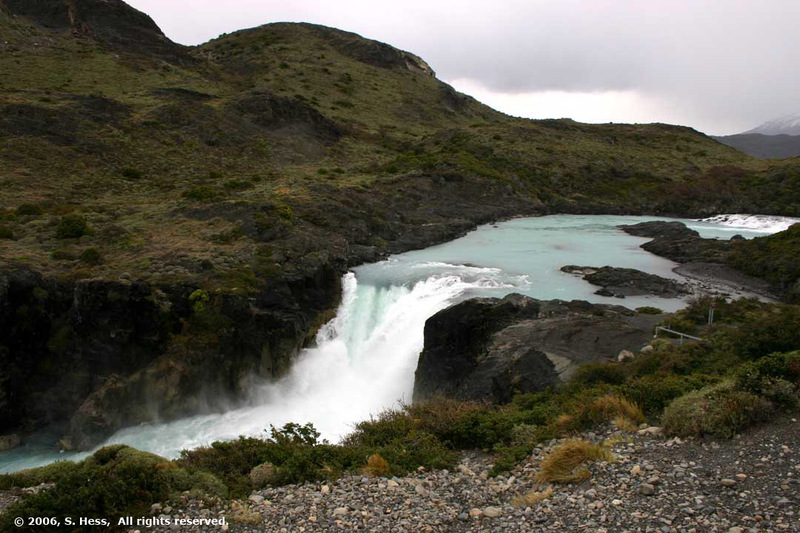 As you proceed north the road goes through the same pasture land that you encounter all the way up from Punta Arenas, sheep, cattle and some wildlife are seen well into the park. Jose told us that the early settlers burned the forest to clear the land and planted anon-native grass known as "cow Grass." 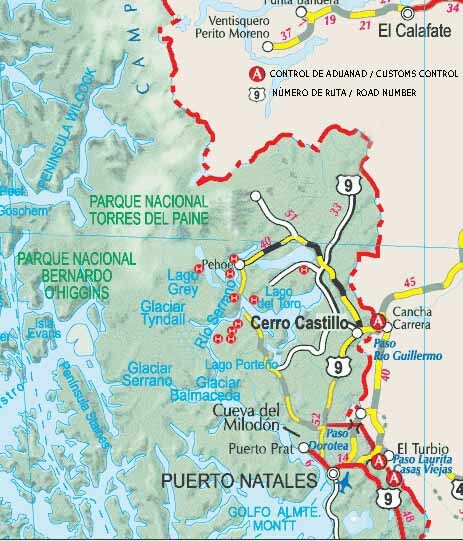 We continued north to Cerro Castillo where we stopped at a small restaurant for coffee. 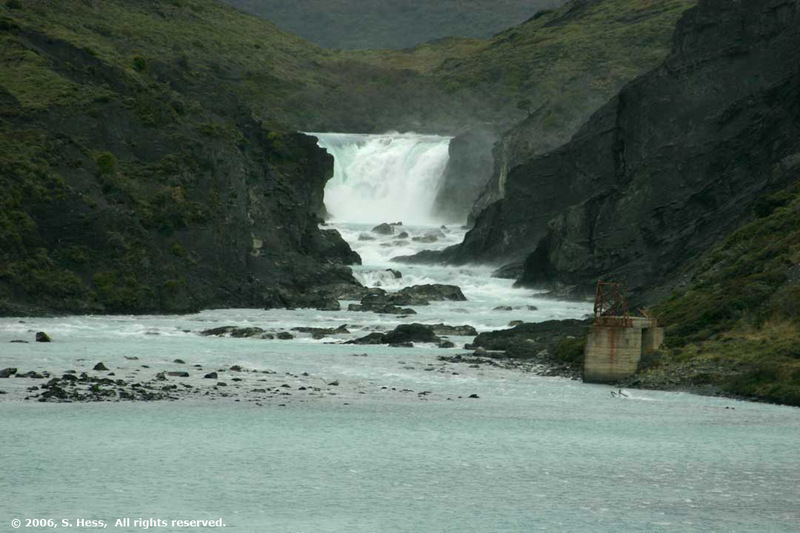 The tour continued north on gravel roads around glacial lakes and past numerous streams. 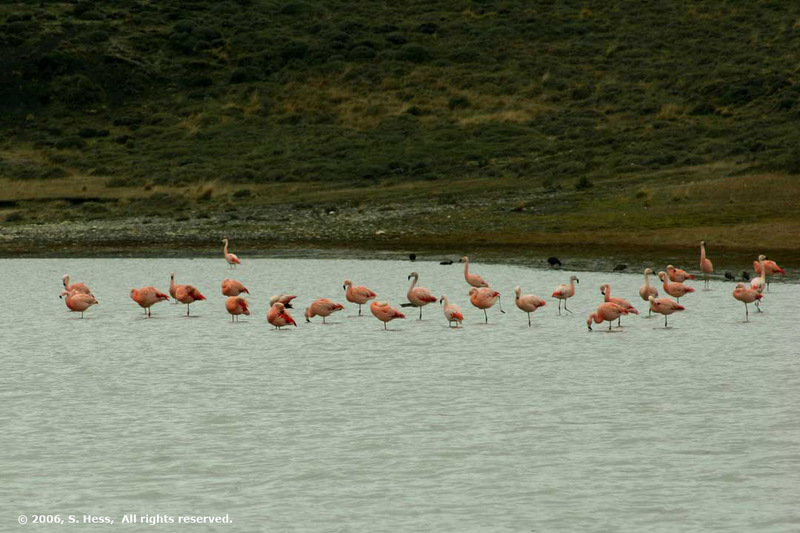 Wildlife in the park consists of a variety of birds and mammals. 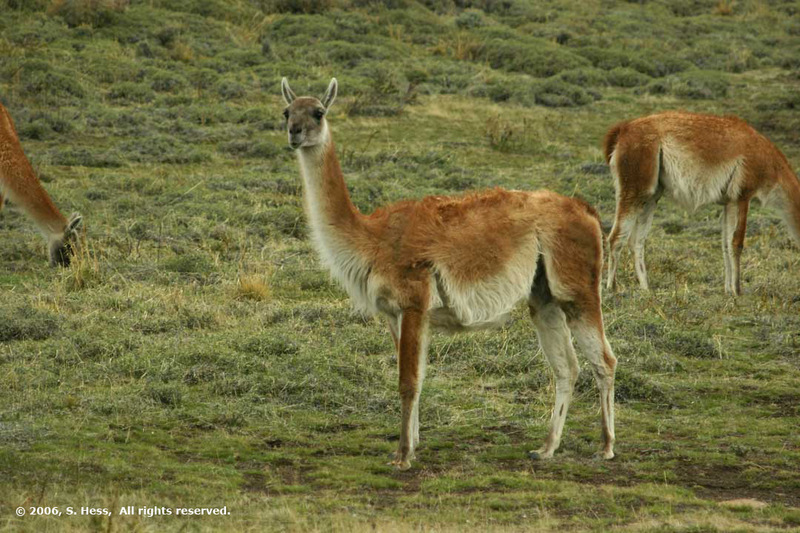 Among the mammals are guanacos, a camelid relative of the llama, foxes, and about 2,000 pumas. The only mammal we saw was the guanaco. Numerous herds are seen along side the road and are one of the reasons that there are so many pumas. Among the birds we encountered were the condors with a wind spread exceeding 6 feet. One of them was hovering low above the road as if to invite us to take a picture. I took some with the small lens. 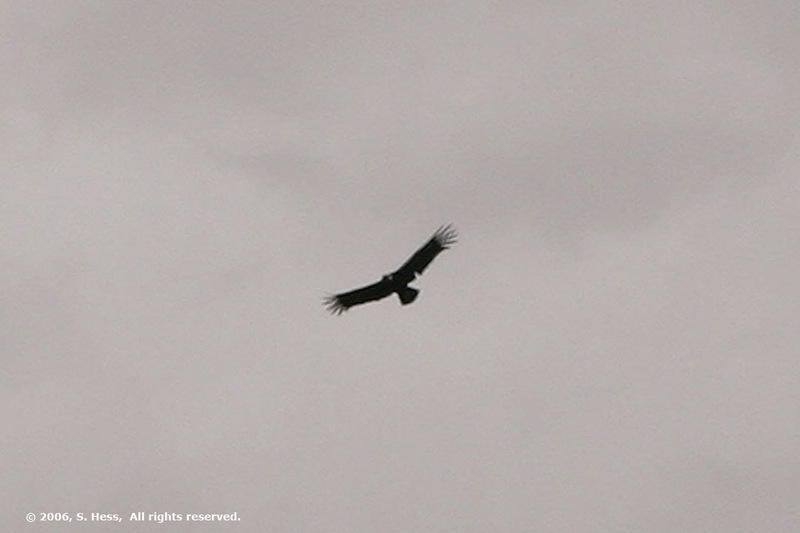 As I was changing to the telephoto lens for a better shot, the condor decided that I had my chance and flew off. The most unique bird we saw was the rhea (locally known as the ñandú). 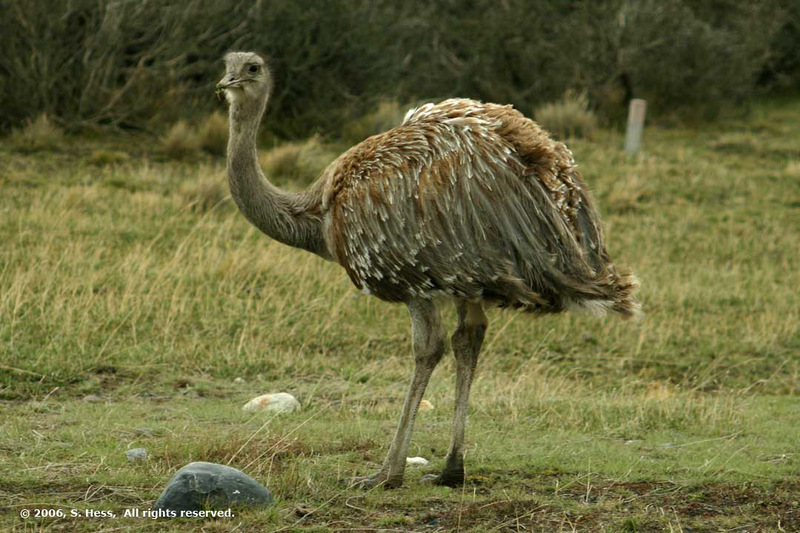 The rhea is a flightless bird related to the ostrich. We encountered one very close to the road so I decided to venture out and take the picture. Jose advised that I should crouch down to approach the rhea as it is a shy bird but is unafraid of anything smaller than it. I got fairly close and then remembered that the rhea's cousin, the ostrich, can rip a lion apart with a good kick and then promptly backed off. After lunch the weather cleared up a bit but the wind was still blowing at a good clip. At one point, we were walking to an overlook to see a waterfall, the wind was blowing at least 35-40 miles per hour with stronger gusts. You had to lean into the wind to keep from blowing away. Susie held on to me as did one of the other women. 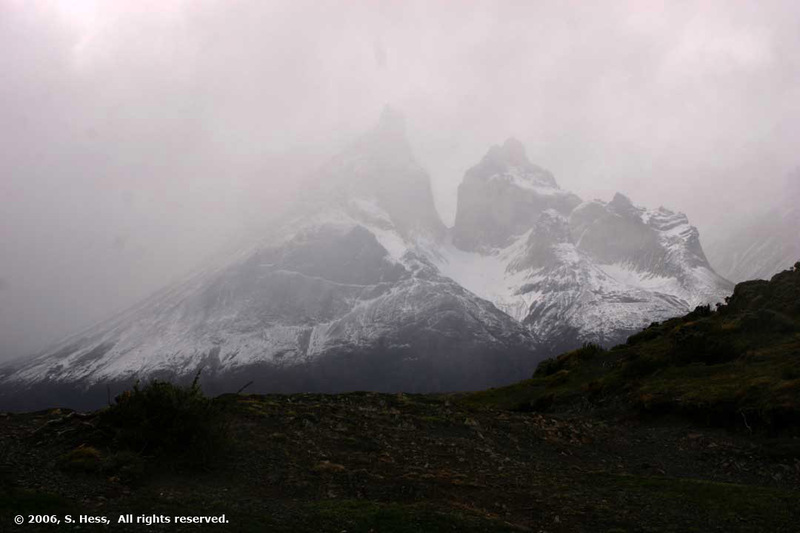 Unfortunately, the clouds did not part enough for us to clearly see the namesake towers of Paine. 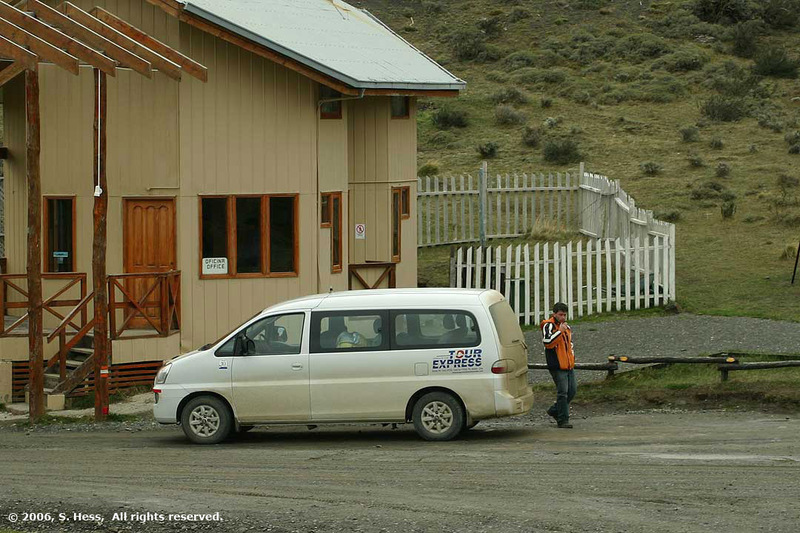 We headed back to Puerto Natales arriving around 8 p.m. As we approached the town, Jose talked to his bosses and arranged for someone to pick us up after our glacier cruise tomorrow to take us to the Cave of the Milodon.